An article featured on TFB told the story of an American father and son trying to build one of the unicorns of the firearms world: the Russian VSS Vintorex. 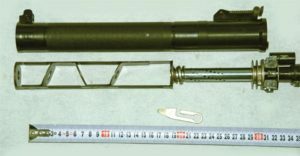 This is quite significant due to the fact that these fully automatic and integrally suppressed rifles, developed by TSNIITOCHMASH (Central Scientific – Research Institute for Precision Machine Engineering) and manufactured by Tula Arsenal never found their way into the US. The rifle fires a 9×39 cartridge with a subsonic 250gr projectile that was developed by Nikolai Zabelin. Great looking rifle!